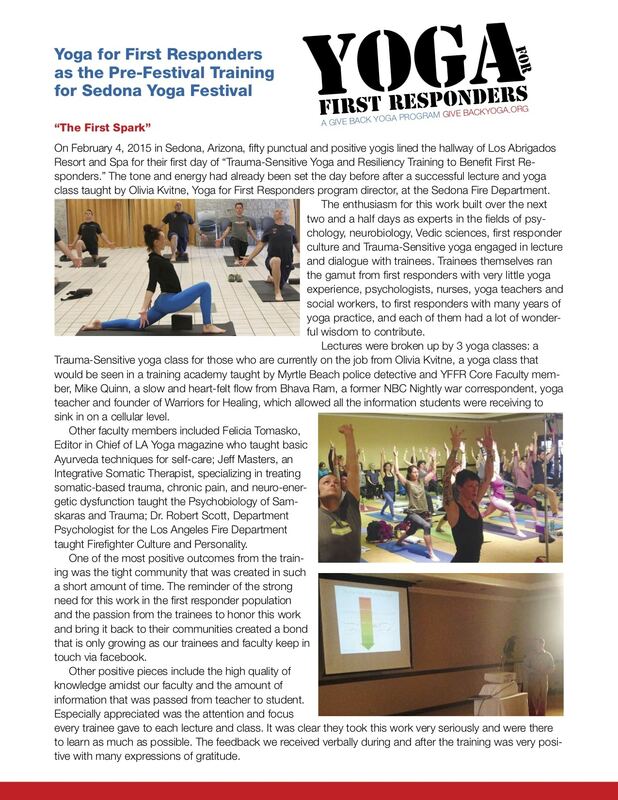 This page is an archive of the Yoga For First Responders training program at Sedona Yoga Festival, February 2015. 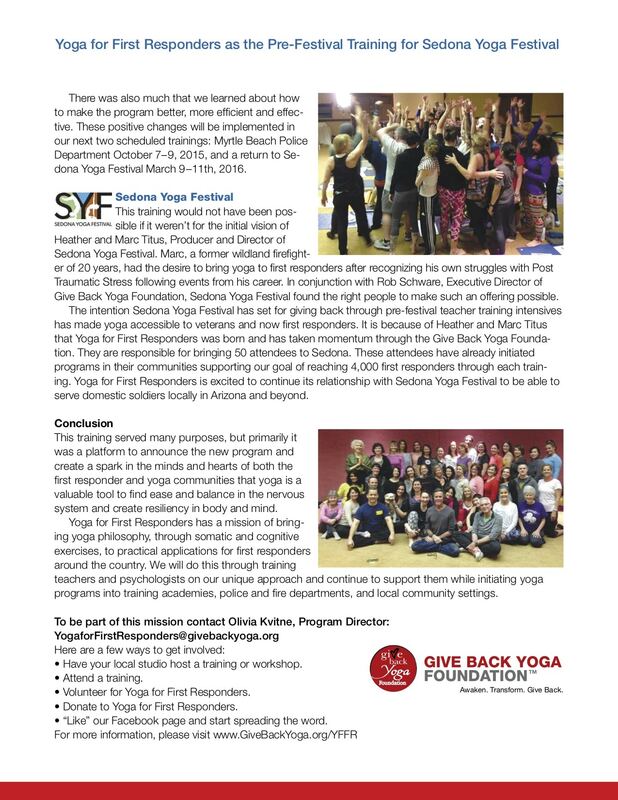 Yoga For First Responders was founded in collaboration with the Give Back Yoga Foundation as the Sedona Yoga Festival Gives Back 2015 project. Brought to you by the Sedona Yoga Festival, a division of Aumbase, Inc. and the Give Back Yoga Foundation. $297 tuition – Upon registering for SYF Gives Back 2015 participants are given a discount code for $100 off the Sedona Yoga Festival, a consciousness evolution conference, which follows the pre-conference and runs through Sunday evening. This training is useful for yoga teachers, psychologists, first responders, or anyone working with first responders and law enforcement personnel dealing with Post Traumatic Stress and Secondary Traumatic Stress. Through yoga practices such as mindfulness, compassion, and physical exercise one can strengthen resiliency in the body, mind, neurological system, and transform how he or she experiences and handles stress. Students will leave this training with the tools and understanding of how to use trauma-sensitive yoga to work with and benefit this population. At Sedona Yoga Festival 2015, in partnership with the Give Back Yoga Foundation, we are offering SYF Gives Back – Trauma-Sensitive Yoga and Resiliency Training to Benefit First Responders and Emergency Personnel: a 2.5-day pre-festival intensive training. We chose to partner with Give Back Yoga Foundation because of their total dedication to making yoga available to those who might not otherwise have the opportunity to experience the transformational benefits of this powerful practice. This training will be held at the luxurious Los Abrigados Resort on Oak Creek in Sedona, AZ. A Room Block will be available. Short Distance from SYF2015 Venues. SYF Gives Back has assembled an outstanding team of teachers, headed up by Program Director Olivia Kvitne. Olivia Kvitne has been a lifelong yoga practitioner, and a yoga instructor for 11 years. While living in Los Angeles, Olivia taught weekly trauma-sensitive yoga classes for the Los Angeles Fire Department (LAFD) Training Center, as well as presenting continuing education workshops on yoga and the neurological system for LAFD, and special workshops for high-ranking command staff of the Los Angeles Police Department (LAPD). All these classes have been through the Behavioral Sciences Departments, working directly with LAPD and LAFD psychologists. Although having recently relocated to Iowa, she has since made frequent visits to Los Angeles in response to requests to teach workshops to the LAFD and LAPD. Her first trauma-sensitive yoga classes for the first responders of Des Moines, Iowa will begin in January 2015. Olivia writes for and is Assistant Editor of LA Yoga Magazine. Her writing for other yoga publications and blogs includes the inaugural issue of Yoga Iowa, with her article on the benefits of yoga in the military being the cover story. As a former award winning network news war correspondent, Bhava Ram was on the front lines of some of the most momentous events of our times, including the Gulf War, Afghanistan, drug wars in South America, and Apartheid in Africa. A broken back and failed surgery ended his career. A subsequent diagnosis of terminal cancer sent him into an abyss of darkness and despair. On the brink of death, he embraced mind/body/spirit medicine and the deeper sciences of Yoga and Ayurveda, through which he ultimately healed against all odds. Through his Deep Yoga School of Healing Arts, he now devotes himself to teaching worldwide. Bhava Ram’s new memoir, Warrior Pose-How Yoga Literally Saved My Life, is scheduled to be a feature film in 2016. Dr. Scott is a licensed psychologist as well as a nationally recognized teacher, trainer, and consultant in the field of trauma/disaster psychology. For over 30 years Dr. Scott has provided significant crisis response interventions and support to first responder populations including fire, police, medical, aviation, military and Red Cross personnel. In 1998, Dr. Scott was appointed Department Psychologist and Director of the Behavioral Health and Wellness Program for the Los Angeles City Fire Department. In addition to his regular duties and activities of critical incident response and training, Dr. Scott directed and supervised the Los Angeles Fire Department’s CISM Team deployment to the World Trade Center Attack in the aftermath of 9/11. During the teams two-week deployment Dr. Scott provided CISM intervention and support to the Fire Department of New York. Dr. Scott also provided similar support with his CISM team to Louisiana Firefighters during a one-week deployment to the hurricane-impacted Gulf States during hurricanes Katrina and Rita. Dr. Scott maintains a private practice where he specializes in the treatment of post-traumatic stress disorder, depression and general stress. Dr. Scott is also an avid surfer and more recently has been learning and practicing Iyengar Yoga. An Integrative Somatic Therapist, specializes in treating somatic-based trauma, chronic pain, and neuro-energetic dysfunction. 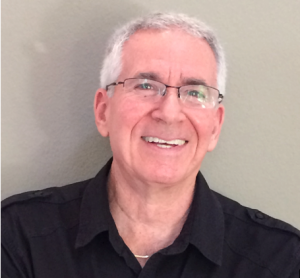 Jeff has been researching and practicing Yoga and Somatic Therapies for over thirty years. In that time he has studied with some of the most gifted minds in the fields of mind/body science including Marcel Vogel (IBM & PRI), Paul St. John (St. John’s Neuromuscular Therapy), Deane Juhan (Job’s Body), Rama Jyoti Vernon (International Yoga College & Yoga Journal) and Dr. Vasant Lad (The Ayurvedic Institute). Jeff has also been certified by the National Academy of Sports Medicine, has been awarded an honorary masters degree in Anatomy and Physiology and is a registered Yoga instructor and Yoga Therapist. Jeff is the founder and Director of Thunder Mountain Wellness, an Arizona based clinic dedicated to vibrant health, wellness and the realization of the fully actualized human potential. Felicia integrates more than twenty years of study of the ancient approaches of Yoga and Ayurveda with her training and licensure as a registered nurse. She is the editor in chief of LA YOGA Ayurveda and Health magazine and serves on the board of directors of the California Association of Ayurvedic Medicine and the National Ayurvedic Medical Association. She is a featured voice on Intent.com and writes regularly on health and well-being for a number of books, newspapers, magazines and websites. In addition to Yoga and Ayurveda, Felicia has worked in cognitive neuropsychology and plant biochemistry research and has degrees in nursing and environmental biology. 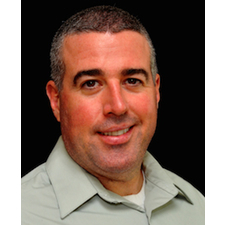 Michael Quinn is a police officer in Myrtle Beach, South Carolina with 10 years experience. He is currently assigned to the Violent Crimes Detective Division and Critical Incident Negotiations Team. Michael is a 200 Hour RYT through Yoga Alliance and teaches yoga to new police department recruits. He is a Staff Member of Yoga In Common Yoga Studio and founder of First Responder Yoga – a free yoga class for police, fire, EMS, ER staff and military. The only way to effectively serve others is if we first serve ourselves. As teachers, especially when working with populations enduring cumulative stress, we can feel depleted as if our well has become dry. Those who provide a service may feel it is selfish to offer themselves the same loving-kindness that they give their students or clients. Olivia offers tips and techniques to build strong foundations in different aspects of life in order keep the joy and inspiration around offering the service of trauma-sensitive yoga to others. Topics will include Ayurveda for every day living with Felicia Tomasko, staying financially sound, how to comfortably set boundaries in the teacher/student relationship, and keeping a nourishing and consistent practice for one’s own body, mind, and spirit. Using all the information taught during this course, Olivia and Michael will then relate it to building a safe and effective yoga class to bring to first responders and emergency personnel. You will experience practicing a common trauma-sensitive yoga series as a student followed by breaking down the different aspects of the class. This includes specific techniques to eradicate trauma from the body, putting these techniques in an appropriate order, contraindications, proper language, useful hints from Olivia and Michael’s hands-on experience and more. Based on this structure, you will feel comfortable eventually creating your own class series. This experiential course accesses the ancient wisdom, sciences and teachings of Yoga to present transformative techniques in practical form for dealing with PTSD and trauma sensitive challenges. Techniques include affirmations, contemplations, breath work, restorative and empowering postures, yoga psychology and yoga philosophy. In one segment of a work week Fire Personnel may be exposed to more trauma, loss, death and destruction than the average person may see in a lifetime, yet despite these stressful, difficult work conditions these rugged, heroic individuals appear to love their careers and report high levels of job satisfaction. How can this be? This presentation will bring clarity and insight about the culture of the Firefighter and Rescue Personality. Drawing from research studies and decades of working side by side with this population Dr. Scott will share key factors and insights that allow first responders, like Firefighters, to thrive in this high intensity, high adrenaline environment while at the same time building strength and resiliency. Additionally Dr. Scott will touch on the vulnerabilities and liabilities that come with being in a profession that focuses heavily on helping victims in need. Caring “helpers” like doctors, nurses, therapists, firefighters, paramedics, etc. who have high levels of sensitivity and compassion for others are most vulnerable to a psychological condition we now call “Compassion Fatigue” or “Vicarious Traumatization.” These conditions and vulnerabilities will be explained and detailed in the context of Trauma Sensitive Yoga for First Responders. Trauma is a vast subject with many facets and aspects of study. Similarly, the system of Yoga, ancient and as deep as the wells of time and space, consists of many disciplines and “tools” that can be tapped to assist us in our everyday lives. At the root of Sri Patañjali’s Eight Limbs of Yoga is the concept of Samskaras, latent impressions that impact our consciousness and, to a greater extent, our lives. During this two-day class, participants will explore the trauma experience, the physiology behind the roots of the trauma experience, it’s connection to the Yogic concept of Samskaras, current research and neuroscience behind the healing aspects of Yoga, and simple practices which can be taken back to support First Responders and their community at large. As part of the class Self-Care for Teachers Providing Yoga as Service, Felicia offers easy daily practices from Ayurvedic principles that keep the body, mind and spirit nourished and rejuvenated as one offers their time and talent to others. Ayurveda shares the same philosophy and ways of approaching the body, mind and spirit as Yoga and emphasizes our relationship to our body, breath, spirit and to nature within and around us. The dual systems of Yoga and Ayurveda, while seemingly ancient and esoteric, hold vital lessons for us to learn how to live with intent and address the needs of living in the modern world. This class takes an inside look at the unique relationships, responsibilities and customs associated with police life. Gain insight to the highs and lows experienced during the course of a police career as well in their day to day functions. Topics such as police training, liability and call response will be presented. Additionally, issues such as police brutality and public opinion are open for discussion. Actual cases and experiences from the law enforcement perspective will be presented and discussed. Upon registering for SYF Gives Back 2015 participants are given a discount code for $100 off the Sedona yoga Festival, a consciousness evolution conference, which follows the pre-conference and runs through Sunday evening.